Habit at State nursery Kahului, Maui, Hawaii (USA). May 23, 2003. Altitude: It grows at around 500-550 metres A.S.L. 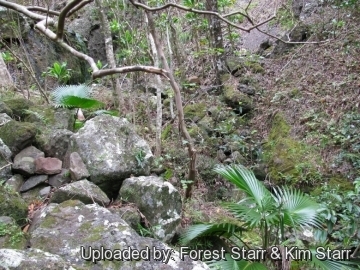 Habitat: Pritchardia glabrata is found naturally in the vicinity of ʻĪao Valley, West Maui on steep slopes and gulches in moist open forest and mesic scrubland. Description: Pritchardia glabrata is an excellent very slow growing miniature fan palm. It is said to be the smallest Hawaiian pritchardia known. It is rarely seen in garden cultivation but highly ornamental. Trunk. 1-2(-6?) m tall, ca. 15-20 cm in diameter, columnar, slender, naked, smooth or fibrous when young, longitudinally grooved, and obscurely ringed by leaf scars. Crown: Canopy open, with ca. 12-16 leaves; width is 3-4 metres. Leaves: Wavy about 65-75 cm long from ligule to leafl-tip; Leaflets up to 70 cm long, chartaceous, strongly folded (irrespective of plications), finely but not deeply split and the split parts are pendant, even in short palms, green above and below, and dotted below with tiny round transparent scales; Petioles smooth and devoid of scales about 40 cm long. Flower: Inconspicuous, pale white to yellowish . Blooming season: Autumn to winter. Fruit: Numerous small, globose or ovoid, 21-24 mm long 16-20 mm wide, on fruit stalks as long as the leaf stalks (petioles). Remarks: Pritchardia elliptica and Pritchardia lanaiensis, are often considered as synonyms of Pritchardia glabrata. It is said to belong to the Pritchardia remota complex. 1) Wikipedia contributors. "Pritchardia glabrata." Wikipedia, The Free Encyclopedia. Wikipedia, The Free Encyclopedia, 17 Mar. 2013. Web. 3 Sep. 2014. 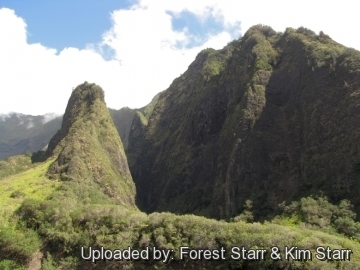 2) Forest & Kim Starr Pritchardia glabrata (Loulu). Plants of Hawaii. <http://www.starrenvironmental.com>. Downloaded on 21 August 2014. 4) Donald R. Hodel "Loulu-The Hawaiian Pritchardia" in the: The Palm Journal 193, page 12. 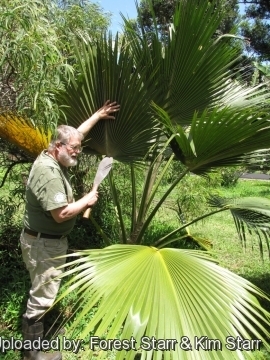 6) David Leaser "Growing Palm Trees in Hawaiʻi and Other Tropical Climates"
7) Gemmill, C. 1998. Pritchardia glabrata. The IUCN Red List of Threatened Species. Version 2014.2. <www.iucnredlist.org>. Downloaded on 03 September 2014. 11) Donald R. Hodel "A Review of the Genus Pritchardia", pages S-3, S-8, S-14-15. 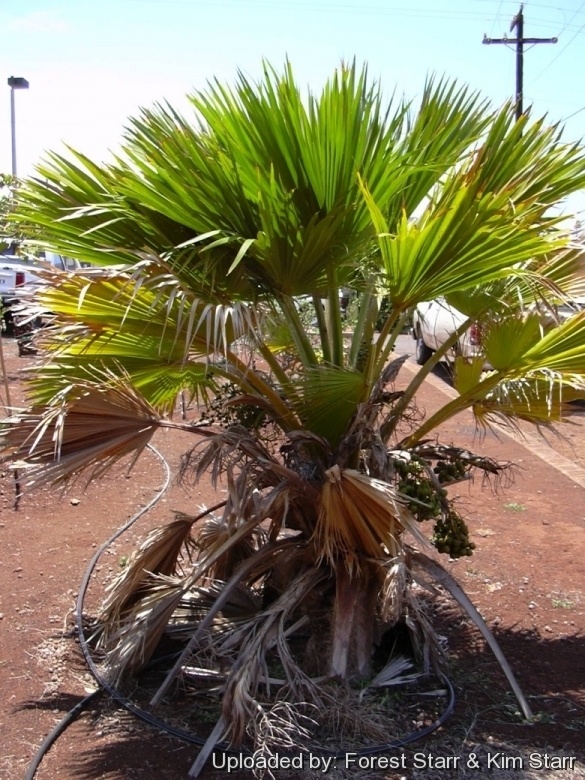 Cultivation and Propagation: Pritchardia glabrata is an easy, but very slow growing palm that likes sandy organic soil, but is adaptable to clay and loam bolth slightly alkaline and acidic. Good drainage is also important. Pritchardia glabrata vary in shape. Specimens raised in dry and/or infertile soils tend to be smaller in stature with smaller leaves. Light also affects the plant's form while those grown in full sun are more compact. Fertilization: Need a perfect fertilizer diet including all micro nutrients and trace elements or slow release fertilizer. Micronutrient deficiencies are occasional problems. If it doesn't get enough magnesium (Mg), manganese (Mn), potassium (K9 and iron (Fe) is indicated by yellowing leaves (chlorotic). Micronutrient deficiencies only show up on soil with a high pH. Fertilize often for faster growth. Potted or younger loulu planted in the ground appreciate a foliar feeding monthly or bi-monthly. Water Requirements: Needs regular water, do not let dry out between waterings. however it does not want to sit in continually wet, mucky soil. The roots and lower trunk can rot if soil is kept too moist. Hardiness: It is adapted to tropical and subtropical climates but tolerate and can't stand temperatures below zero; they should be grown in cold green houses or at least in a place where they are sheltered by the wind; However mature specimens can endure temperatures down to about -4°C (for short periods), while young plants are more cold sensitive. Maintenance: The dead leaves, flowers and fruits can be removed in a landscape setting for a cleaner appearance. Do not prune the fronds that still have some green colour. 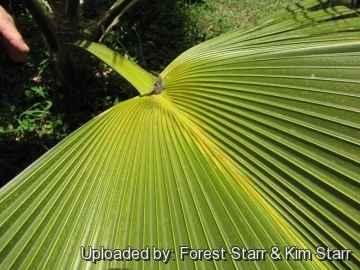 Palms recycle nutrients from dead or dying fronds and use them for healthier fronds. Palms only have a set number of new leaves that can sprout and grow per year and removing fronds will not increase that number. If you cut off more than what will grow annually, you could be left with a pretty bare and bald palm. Wind and salt tolerance: This palm is wind and somewhat salt aerosol tolerant, but does a lot better inland then it does on the coast. With a particularly windy climate it is suggested to secure young palm to long solid stakes, to avoid that the wind could bare young and not very developed roots; specimens which are only a few years old might fear intense wind. Pest & diseases: It is prone to leaf rollers, red spider mites and sugar cane borers. Rats will eat the fruit. Early Hawaiian Use The hard wood of the trunk were fashioned into spears. The trunks loulu were notched for climbing to gather the immature fruits and fronds. Older specimens still bear notches that can be seen today. 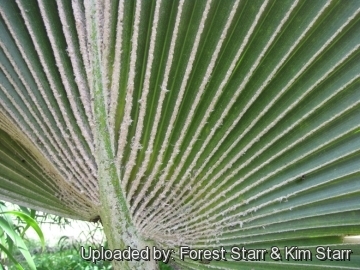 The fronds were used for thatching and as plaiting such as papale (hats) and fans. 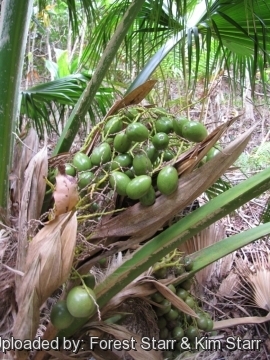 Food use: The young fruits called hāwane or wāhane are edible and can be eaten after being peeled. 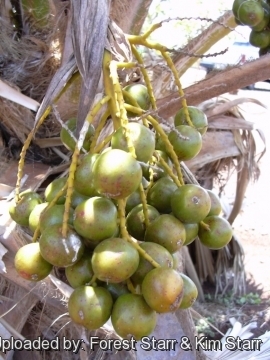 The flavour of fruit with the soft interior is similar to coconut. Ornamental: It is cultivated as an ornamental tree, and planted in gardens and parks in tropical and sub-tropical climates either as a single specimen or in groups. Culture in containers is possible although growth rates are slower. A bright patio will provide an excellent environment for young specimens which can eventually be planted in a sunny location. 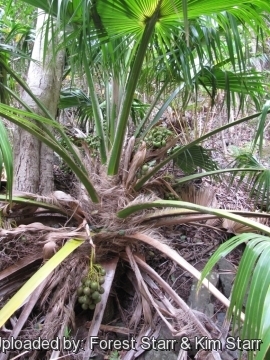 Propagation: Mature seeds buried half way in pot of clean, well drained potting soil, water daily, sprout in a few months, plants of 1 foot can be put in ground/larger pot; Because these palms easily hybridize with other Pritchardias, claiming a specific species requires seed collection from wild populations.